Benjamin Hoffman served as a student intern with Studio B Fine Art Gallery while a junior at Kutztown University, pursuing a B.S. in Art Education, B.F.A, in Fine Arts, and minors in Art History and Music. 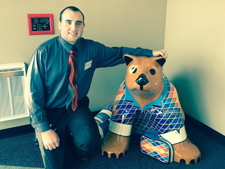 In a happy coincidence, at the time an artist was needed to fashion the credit union’s bear, Ben was serving as Studio B’s intern. As a student at Kutztown University, he had heard about the studio’s need for volunteer help and the varied opportunities the studio would provide to expand his college field experience in the arts. Ben’s signature art style features geometric shapes and is very detailed and precise. Diamond shapes were a natural for him in fashioning the bear’s colorful appearance. 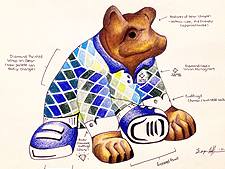 Clever details include the bear’s diamond cufflinks and the diamond-shaped tread on his sneakers. 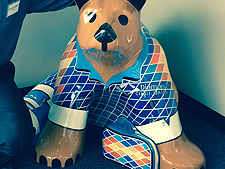 “Gem,” as Ben calls “his” bear, presented assorted challenges to Hoffman throughout the project—offering Ben some real-world experience in creating work on commission. Diamond Credit Union is a Pennsylvania state-chartered community credit union serving Berks County and the Tri-County Region by offering low cost, state-of-the-art financial services with world class service since 1947. Diamond is a not-for-profit, member-owned credit union. 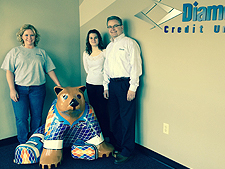 With over $415 million in assets and over 47,000 members, Diamond is one of the area's largest credit unions. Anyone who lives, works, worships, regularly conducts business, or attends school in Berks County and the Tri-County Region is eligible for memberships.